On Sundays, we’re going to take a moment to step back and think about our writing from a wider view. In order to do that, I’ll post some guided questions—feel free to answer them here with as much or little detail as you’d like; or answer them on your own blog or on Facebook. Or just write the answers down in a private journal or notebook. The important thing is to actually think through and write down your answers. 1. What are your key daily responsibilities that cannot be put aside for writing? 2. What priority does writing take in your life? 3. What would you be willing to give up, for just 30 days, in order to have more time to write? 4. What are some obligations and commitments you currently have that you can reprioritize and/or reschedule in order to build more writing time into your daily schedule and give your writing the priority in November? I look forward to seeing your answers and will be posting mine soon. Work. That’s pretty much it. I’m spending this (Sunday) afternoon cooking meals—pot roast, chicken soup, meatballs, etc.—and meal planning so that meal prep isn’t really even that much of a blip on my responsibility radar this week. Other than my day job and keeping myself alive, clean, groomed, dressed, and healthy, I have no other responsibilities. So far in this challenge, much lower than it should, and I’m not even writing yet. I’m avoiding the prep work, which is usually the part that’s more fun than writing can be. Yet I find myself slipping into patterns of laziness and procrastination. And by doing that, I’m telling myself that this process, that my writing, isn’t important enough for me to be motivated to (or to make myself) do it. That needs to change. I’ve already stopped watching most of my TV shows (I have three or four episodes of most sitting in Hulu unwatched). Unfortunately, I’ve replaced that with binge watching vlogs on YouTube (such as Gone to the Snow Dogs, Snow Dogs Vlogs, and Press Record, among others). Since they’ve all been blogging for four or five years, there are thousands of videos for me to catch up with, right? Because there’s no way I can enjoy the content they’re currently putting up if I haven’t gone back and watched hundreds of hours of their videos. So that’s what I need to give up. My YouTube vlog addiction. Because, you know what? All of those videos will be there after I finish writing this draft! See answers above. Other than a couple of Saturdays on which I’ll get together with friends for brunch and a movie, along with my trip to visit my parents for Thanksgiving in November, I really don’t have anything keeping me from spending four or five hours a day working on this project. I just need to DO IT. Journaling my answers now. Will be posting on my blog before I go to bed. I MUST name my heroine! I’m hoping that by starting all over again on writing out her backstory, she’ll reveal her name to me. Because I can’t just keep calling her Heroine. Believe me, I thought about it. But she’s not responding to that name either. So I’ve spent the last three or four hours diving into her parents’ backstories to see who they are in order to find out who she really is. I did discover that her mother isn’t Greek after all—that she’s the daughter of a professor of Greek who moved his family to the Massachusetts colony in 1763 to take a teaching position at Harvard College. And that Nicola and Alexander (Heroine’s parents) met at a ball in Boston in 1775, shortly after he was stationed there as a newly minted Post Captain in the Royal Navy at age 24. Still some work to do, though! Oh, but I did discover her “spy name”—she’s the White Falcon. – Caring for my children – my preteen is fairly self-sufficient but still needs some of my time and my toddler is…self-explanatory. – It’s always taken a back of the bus backseat. I always wanted to make it a priority as it’s important to me but self-doubt (and an odd fear of success) has kept me from moving it to at least the 3rd most important thing in my life. I’ve even recently learned that my constant reading, while a truly enjoyable pastime for me, has allowed me to drown out all the voices of stories I want to write calling out. 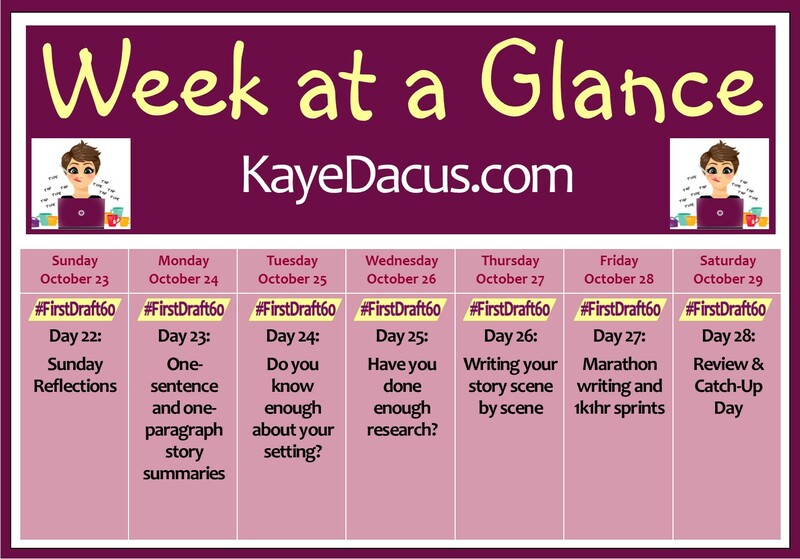 – Since I decided in late September that I wanted this NaNoWriMo to be the one that I succeeded in completed a first draft and stumbled upon Kaye’s #FirstDraft60 challenge on its 2nd day I have mostly succeeded in moving my writing to around the 5th row of my mental bus. I’ve had days where I don’t get much done and I fall behind then binge prep to catch up but for the most part I’ve done something everyday but still fell into some of my common sidetracking procrastination and got less done than I could have. – Reading – I have actually already given this up for prep. I had intended to use it as a reward for myself for getting my daily prep work done and then meeting my daily word count goal but since stopping I find I think about my own story constantly, even when I’m not working on it and I’m now afraid to pick up a book lest I drown out my own fledgling story again. – Bible study – I actually enjoy going (and probably will have to keep doing so) but we are currently doing ‘The Truth Project’ which basically entails watching one DVD episode per Bible study and maybe talking about it a bit before we close in prayer. So while it’s interesting it doesn’t feel like the best use of that time to me when I want to be working on my story. – I recently went and did a large grocery shop and bought several frozen pizzas, lasagnas, shepherd’s pie and other easy to throw on a tray and chuck in the oven kind of foods so that during November I can have the option to not think about dinner. I also need to remember to utilize my crock pot more and make pot roasts as those make for pretty easy dinners too. 1. What are your key daily responsibilities that cannot be put aside for writing? I am a blessed woman. I have two part-time jobs that usually add up to only 30 hours per week. My children are self-sufficient adults. My husband just put in a load of laundry so that I could write. I am a “book person” at a used-book store, punching a time clock; bookbinder with paying clients and deadlines; then housework (we have no dishwasher but he also does dishes), errands, a volunteer commitment one morning/week; grocery shopping, cooking 4x/week; a writer’s group; church and small group meetings; personal hygiene :). 2. What priority does writing take in your life? Till now, way down on the list. But that is changing as of this week. I semi-consistently blog about my bookbinding work because I love it, and also so that I have a platform for my “cozy bibliomystery” novel about a bookbinder who solves mysteries. 3. What would you be willing to give up, for just 30 days, in order to have more time to write? (1) Watching DVDs in the evenings. I’ve justified it by saying I’m tired and not creative in the evenings, but there are writing-related things I can do to prepare for the next day’s writing. (2) Newspaper reading for an hour in the morning. I can cut that time in half without losing touch with the outside world. (We have a monitor and DVD player, yes, but no cable TV whatsoever. My news comes from CNN online and The Washington Post.) (3) Not so much Facebook time. Two 10-minute visits a day would be sufficient. (4) Get up an hour earlier. 4. What are some obligations and commitments you currently have that you can reprioritize and/or reschedule in order to build more writing time into your daily schedule and give your writing the priority in November? My schedule has room in it right now to add 2 writing hours a day without any strain. In the past, writing (and bookbinding) projects have followed a ramping-up trajectory and I devote more time to them as I race to the finish. 1. Work, 2. Very high on my list. I write and blog daily. 3. TV and social events. 4. DVR the TV shows I cannot live without and watch them in December. I’ll be waking up an hour earlier to blog (easy to do with time change). Work. Some weeks, it goes until late in the night. Other times, it last all weekend as well. Need to remember to sleep as well. I need to make it a bigger priority. I got stuck on a revision, and I think it has put a mental block on my writing. Nano should un-stick me. I’m using the DVR a lot more in November. And sleeping even less as well. I can’t change the priority or reschedule any obligations/commitments because they must be done at certain times. Also, I don’t have much authority to change some of these dates. Caring for twin toddlers full-time while balancing 20 hours of work each week. My husband is a great help when he gets home from work, which allows me to do my job, but writing always has comes after the kids and the income-generating work. And I also try to associate with the hubs a little each day so we don’t forget each other entirely. It’s the activity I love most. Climbing inside a character’s life and making it into something real is more fun to me that almost anything. But I’m left with little time to write after the necessary demands of paying bills and caring for my toddlers. I’m trying to learn to reorganize my time to make better use of it, but to be honest there just isn’t much of it to go around. One thing my kids do well is sleep (and now I’ll be crossing my fingers in hopes that I have not just jinxed that by writing it down). I’m going to do my best to get up two hours earlier than usual and write during that time. I’m typically a night person but I think shaking it up and dedicating morning hours to something so important to me might help keep me focused. I don’t have much flexibility in my day, so all I can really do is try to add hours to my morning before the day gets going. I’m also going to try to write during the day while my kids are playing, but they don’t usually give me much chance. If I’m nearby–a necessity, since they’re not quite two years old–they want to be in my lap or climbing all over me. Sweet, but not conducive to writing, unfortunately.